Last semester (Fall 2016) I did an experiment at the City College of New York, where I am a faculty in the Department of Philosophy: I taught a course in applied Stoicism. That is, I didn’t teach the class as part of our offerings in Ancient Philosophy (I’m not qualified for that, we have my excellent colleague, Nick Pappas, to cover that area), but rather as an example of applied philosophy. Of course, I did introduce my students to the ancients, but I also used a modern Stoic text, as well as peppered the semester with practical exercises for the students to carry out in groups or on their own. I chose four texts for the course: Seneca’s Letters to Lucilius, Epictetus’ Discourses, and Marcus’ Meditations, accompanied by A Guide to the Good Life, by Bill Irvine. Throughout the semester we alternated among these four, beginning with an overview of Stoicism from Irvine’s book, then taking up a letter from Seneca, moving to a chapter from one of the books of the Discourses, and finally one of the books of the Meditations. And then back again, cycling through more Irvine > Seneca > Epictetus > Marcus. v) To improve analytical writing skills. The students were evaluated by means of a midterm, a final, and a blog discussion that lasted throughout the entire semester, were they really opened up in terms of applying Stoic principles to their lives (their privacy was guaranteed by hosting the blog on an intranet). The blog in particular was an enlightening experience. City College students are ethnically, religiously, and socioeconomically very diverse, so it was fascinating to see how they found Stoicism useful to deal with the small and large problems characterizing their very different lives. I just received the students’ own evaluations of the course, and I am going to present some of the most interesting bits below. This material convinced me to ask my Department to make the course a permanent offering (it was presented the first time as an experimental course). To the question: “did the course stimulated your interest in the subject matter?” 100% of the students (n=12) responded with the highest mark, 5/5. To the question “was what you learned from the course worth your time and effort?” ten students responded with 5/5, two students with 4/5. To put things in perspective, these were without a doubt the highest responses I got for any course I have taught so far (and I usually do get high marks for those questions). Does anyone know of any other college level courses on Modern or Practical Stoicism? Let me know, and share the syllabi if available! This entry was posted in Modern Stoicism on May 9, 2017 by Massimo. Love it! I work in higher education and teach a one credit First Year seminar course designed to help student succeed early in college and learn some practical skills they can apply throughout their college career. 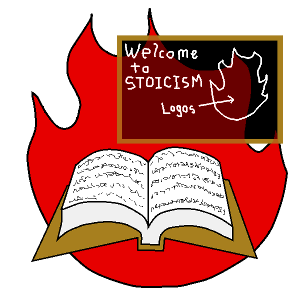 I am sold on Stoicism as student success system and although I have not presented applied Philosophy in a classroom setting I am planning to this Fall and the blog post was very helpful. I am just winding up a semester doing something similar at the University at Albany. The course is graduate level Organizational Leadership, taught (primarily) to students working toward MS or PhD in educational policy and leadership, or Advanced Grad Certificates in school leadership. The course typically tracks all of the contemporary leadership theories, but I aligned each week with one of Marcus’ books and Epictetus’ Enchiridion, and required students to meditate on Marcus, and relate Stoic principles back to the various leadership theories via multiple weekly blog/discussion forum entries. The results have been far better than I expected. The course still has one class left, then the final – which will involve each student producing a personal Enchiridion for Leadership. None of the students had been exposed to Stoic philosophy prior (in fact, most had never taken a philosophy course). This courses was not taught as a philosophy course, either. Rather, it was designed to provide future leaders with personal tools to lead. Massimo, I will share the syllabus, etc. with you directly via email. I am convinced that these modern experiments infusing Stoicism into non-philosophy courses is important. However, the last part of the course focused on an “enduring question”: what is happiness? The textbook has many terrific readings on the topic, including excerpts from WALDEN, an interview with the Dalai Lama, and…12 sections from the Enchiridion! (You can see the table of contents here–scroll down to the very last section: http://bit.ly/2pvbOvM ). The class had to complete a series of “mini-assignments,” including writing a 250-word essay on which one of the 12 excerpts from Epictetus they agreed with the most. The responses were compelling. Students had no trouble seeing how Epictetus’s ideas might be applied to their own lives. For the final writing assignment, I asked the students to reflect on the happiness section of the course: Can reading/discussing/writing about happiness help anyone on their quest for happiness? Over half the students who answered “yes” singled out the Epictetus excerpts as “proof.” Their reflections were quite personal, with students saying that reading Epictetus really helped them deal with recent difficulties in their lives. I was not expecting such a strong response! Several students wanted to learn more, so I pointed them toward your “24 Spiritual Exercises” booklet. Anyway, I just wanted to pass that along. Congratulations on the new book! My copy will arrive by mail today. Looking forward to it! Hi Massimo, great results, and great news that the course is becoming permanent, congratulations! Speaking of learning about Stoicism: At 11:10 PM May 8, I received a notice from Amazon that my Kindle copy of How to Be A Stoic was available. I’ve read the introduction and look forward to reading the remainder of the book.